Most text books that one reads about politics or administration, begin with Darius I of the Achaemenid Dynasty and his admirable system of ruling a vast empire that stretched from China to Greece. In books about wind energy technology, too, one reads that the technology was fi rst developed by ancient Iranians, the fi rst windmills having been found in Sistan Province, in southeast of Iran. After the discovery of the wheel, the windmill was the brightest invention of the mankind. It is argued by some scholars that the windmill preceded the wheel, but this seems unlikely and in any case irrelevant. What matters is that the two inventions had reciprocal effects on one another and one helped to improve the other and vice versa. It is not clear when exactly human beings began to use the wind force but it can be said with a strong degree of certainty that Iranians fi rst managed to use the wind force to grind wheat and draw water from wells, a few thousand years before Christ. Sistan, and the Khaaf Plain in particular, have winds that last 120 days or so and it is the very existence of this wind that must have forced the people of the region to fi nd ways of controlling and using it. The winds called "the winds of Harat" blow from April till July/August and are thought to originate in the Pamir on the Iran-Afghanistan border and they blow at their highest speed in the Sistan region. In 1905 a group of British offi cers working on the Iran-Afghanistan border to determine its exact path reported that for 16 days a wind had blown at a speed of 140 km/hour and that within four days the wind had killed 200 camels. The fi rst Iranian windmills date back to millenniums before Christ, and the fi rst were probalby made and put to use in a region spreading from Sakestan or Sistan to Ghahestan or Koohestan, but no written evidence are presently at hand. "... Omar asked 'What works can you do?' The slave said 'Paining, carpentry and forging.' Omar said 'What you pay to Moghaireh is not unfair considering what you can do'. Abu LoLo left grumbling. Another day he passed Omar, on his way. 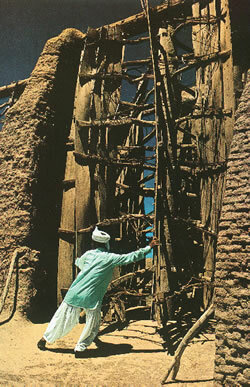 Omar said to him 'I hear you have claimed to be able to make a mill that works with the wind'. Abu LoLo said 'I will make you a mill that people shall talk much about it.' When he left, Omar said 'This man threatened me.'" (Abu LoLo finally killed Omar with a dagger). 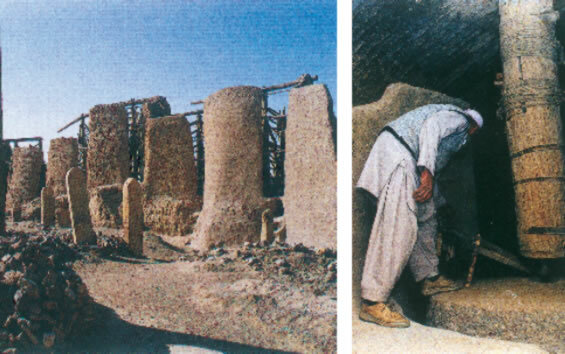 In a well-known book written by an unknown person and titled "History of Sistan" one reads "... (they have made) mills that run by the force of the wind and produce flour... and they have produced similar wheels to draw water form wells (to transfer) to gardens and lands where they farm... they make great use of the wind." Iranian windmills had vertical axles and horizontally turning vertical 'blades', that is fl at vertical blades that are pushed by the wind to turn the axle to which they are fixed and thereby turn a millstone. The blades are vertical and very high and as they are pushed by the wind they turn the axle which thus transfers the force and the movement to rotate the grinding flat stone over a fi xed stone below it. Notebaar, the renowned Dutch scholar who has made extensive studies on the subject of windmills, writes "This is the way windmills are made in Sistan: First a small tower is built. The windmill consists of two parts. The lower part is where the stones are to be found which grind the wheat through the turning movement of the upper millstone. In the upper part there is an axle which is turned by the wind. Through this movement the upper millstone at the lower part of the mill, is rotated." It can be said with great certainty that through the Moslem Empire (Andalusia in Europe) and through the Crusades the design of the Iranian windmill reached Europe, where the idea was improved to form the vertical "sails" or the Dutch type windmill but the Iranian design continued to be used in some parts of the world, such as Poland, down to the 19th century. In 12th century AD, Europe was faced with a population explosion and the use of watermills proved to be inadequate, so was the use of mills that were run by human or animal force. Therefore, windmills became increasingly popular all over Europe. The Iranian type windmill had a simple structure but it had low effi ciency, and therefore the Dutch type windmill with "sails" that turned in a vertical plane were fi rst developed around 1180 AD in the northern parts of France, on the North Sea and gradually spread across Europe because of the higher efficiency. By 1580 they became a common sight all over Europe and reached the eastern coasts of the Black Sea. Today one can see the Dutch type windmill in many parts of the world notably in Holland itself the home of the Dutch type windmill. 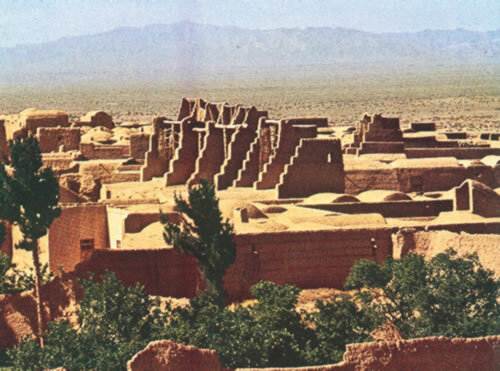 In Iran, however, the local type continued to be used and even today they can be seen in certain parts of Khorrasan and Sistan provinces, particularly south of Khaaf, in the plain of Zozan.